In today’s competitive Monterey economy, having a creative business sign can dramatically improve an establishment’s ability to attract new business and retain its current clients and customers. It is important to remember that even in this era of Internet advertising, many businesses get the majority of their customers from walk-in traffic. Fortunately, these are precisely the people who will be attracted by a creative and attractive business sign. Signs By Van can help a business, no matter its size or type, by designing and building an eye-catching business sign. Every sign starts with a great idea. A business sign tells the customers all they need to know about the business while also arousing the customers’ interest. For that reason, the sign designer works with the client in order to create a unique sign that encompasses everything the client wants to say about his or her business. This is especially important in areas where there are many businesses, as the sign will have to stand out from the crowd. Furthermore, the sign has to fit in with the image the business owner wants to project. An antique store will want a far different style for its sign than a night club would! For example, one winery sign incorporated both stainless steel and plate steel, which gave the sign an ever-changing look as the plate steel rusted and changed over the course of the year while the stainless steel remained pristine. 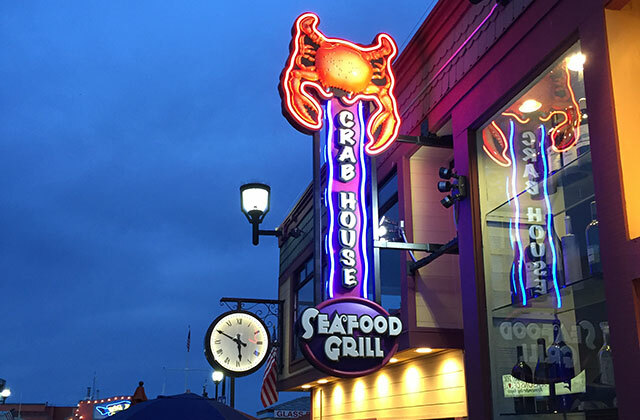 On the other hand, the Crab House, a restaurant located at Monterey’s Fisherman’s Wharf, decided that it wanted the type of sign that would stand out from its competitors’ signage. In this case, a striking sign design was combined with cutting-edge LED lighting in order to draw customers from the surrounding area to the restaurant. Because Signs By Van provides high-end dimensional signage, these signs are not simply a collection of lights but are also painstakingly produced three-dimensional sculptures. This allows the designer to be even more creative in developing the sign, providing a vast range of styles and appearances that would otherwise be impossible. This dimensional sculpture style is one of the most effective ways to create a noteworthy business sign that can drive traffic to the owner’s establishment. Next to a sign’s design, one of the most important aspects of a creative business sign is its placement. It must be located so that it is easily visible and where the it contributes to the overall appearance of the establishment. This can require skillful and creative placement of the sign and any lights that will be used to illuminate it. In addition, the best placement choice for a business sign can vary depending on the establishment’s hours of operation. A sign that that is mainly intended to attract daytime customers will require a different style of placement and lighting than one that is intended to be used by a night club. Finally, Signs by Van produces high-quality signs that are designed to last for at least twenty-five years, allowing owners to have confidence that their Monterey business signs will continue to draw customers for decades to come. The expert craftsmen who created the sign understand how important it is to the client, and will make certain that every sign they create will be a high-quality credit to the client’s business. Ultimately having a creative Monterey business sign can help a company stand out from the competition while also letting every viewer know what services and products the business offers. From coffee shops to high-end art galleries, having a creative business sign can be a vital part of attracting the consumer attention businesses need to prosper in today’s economy.